The aim of our research is to identify molecular-based disease classifiers using clinical omics to underpin precision medicine approaches to be used for the selection of patients for the appropriate therapy. As the Director of the Oxford NHS/BRC Molecular Diagnostics Centre (MDC), Anna Schuh leads on a translational research programme for the development, validation, standardisation and evaluation of clinical utility of next generation technologies and clinical omics. Her laboratory has developed the first fully certified next generation sequencing multi-gene panels for use in NHS diagnostics of cancer and a number of haematological malignancies. The MDC has been designated an NHS England Genomic Medicine Centre and partners with Genomics England in the implementation of whole genome sequencing technology to provide NHS diagnostics. A particular focus of the laboratory is to define molecular-based disease classifiers for cancers and haematological malignancies that underpin precision medicine approaches including risk stratification and rational treatment design. Using samples from national National Cancer Research Network (NCRN) clinical trials, my group is also interested in the evaluation of the clinical utility of whole genome sequencing and was first to publish longitudinal studies of whole genome sequencing (WGS) from chronic lymphocytic leukaemia (CLL) patients undergoing treatment. A current focus of the laboratory is to further characterise hyper-mutated non-coding region in the CLL genome and to examine total RNA expression in CLL. In my role as the clinical lead for CLL and other lymphoproliferative disorders for the Academic Health Science Network, I am a Chief or Principal Investigator on a number of early and late phase clinical trials that are currently undergoing review by the National Institute for Health and Care Excellence (NICE), which are likely to change clinical practice for treatment of relapsed CLL patients worldwide. I also have a particular clinical focus on Richter’s Syndrome (high grade transformation of CLL) and am the Chief Investigator on the first ever Phase 2 clinical trials for this rare patient group. Figure 1: Genome-wide clustering reveals changes in mutation profiles. (A-C) Grouping of somatic mutation profiles for all single nucleotide variants (SNVs). Absolute white blood cell (WBC) and lymphocyte (LY) counts are shown at the top of each figure. 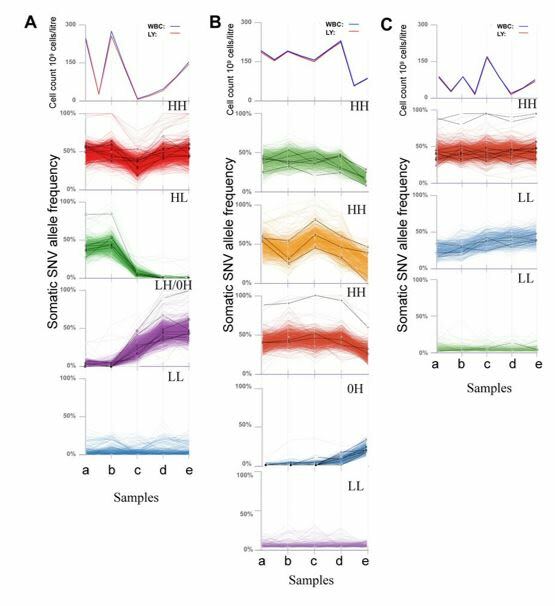 The bottom panels show genome-wide SNV frequencies plotted against the 5 time points. Mutation profiles for coding genes are shown as black lines. Clinical whole-genome sequencing from routine formalin-fixed, paraffin-embedded specimens: pilot study for the 100,000 Genomes Project. Whole-genome sequencing identifies homozygous BRCA2 deletion guiding treatment in dedifferentiated prostate cancer. Using Genomic Information to Guide Ibrutinib Treatment Decisions in Chronic Lymphocytic Leukaemia: A Cost-Effectiveness Analysis. Whole-genome sequencing of chronic lymphocytic leukaemia reveals distinct differences in the mutational landscape between IgHVmut and IgHVunmut subgroups.